Hepatic and peritoneal metastases of gastric cancer are operation contraindications. Systematic review to provide an overview of imaging in predicting the status of liver and peritoneum pre-therapeuticly is essential. A systematic review of relevant literatures was performed in Pubmed/Medline, Embase, The Cochrane Library and the China Biological Medicine Databases. QUADAS was used for assessing the methodological quality of included studies and the bivariate model was used for this meta-analysis. Totally 33 studies were included (8 US studies, 5 EUS studies, 22 CT studies, 2 MRI studies and 5 18F-FDG PET studies) and the methodological quality of included studies was moderate. The result of meta-analysis showed that CT is the most sensitive imaging method [0.74 (95% CI: 0.59-0.85)] with a high rate of specificity [0.99 (95% CI: 0.97-1.00)] in detecting hepatic metastasis, and EUS is the most sensitive imaging modality [0.34 (95% CI: 0.10-0.69) ] with a specificity of 0.96 (95% CI: 0.87-0.99) in detecting peritoneal metastasis. Only two eligible MRI studies were identified and the data were not combined. The two studies found that MRI had both high sensitivity and specificity in detecting liver metastasis. US, EUS, CT and 18F-FDG PET did not obtain consistently high sensitivity and specificity in assessing liver and peritoneal metastases of gastric cancer. The value of laparoscopy, PET/CT, DW-MRI, and new PET tracers such as 18F-FLT needs to be studied in future. Although the decreasing incidence and mortality, gastric cancer remains the fourth common cancer and the second leading cause of cancer-related deaths with poor prognosis worldwide [1, 2]. As we known, treatment option, decision-making and prognosis of gastric cancer are strongly dependent on the extent of tumor (tumor extension, nodal involvement and distant metastases), accurately pretherapeutic staging is essential . It was reported that the rate of liver metastasis in gastric cancer can achieve 5-9% [4, 5], and the number of liver metastasis is a significant prognostic factor of gastric cancer [4, 6]. Generally speaking, gastric cancer has extrahepatic metastasis if hepatic metastasis, such as lymph node involvement and peritoneal seeding. Surgical resection is rarely required under these circumstances . Peritoneal metastasis, mainly induced by the dissemination of free tumor cells from the primary gastric cancer, is one of the most common types of spread and the causes of death . Peritoneal metastasis of gastric cancer was considered to be operation contraindication and the most difficult type for treatment . Studies suggested that imaging methods of evaluating the pre-operative status of hepatic and peritoneal metastases have two effects [9, 10]: 1) avoiding unnecessary laparotomy; 2) assessing the effectiveness of neoadjuvant protocols in the absence of histopathological confirmation. Although systematic review and meta-analysis of imaging in assessing local staging and lymph node status of gastric cancer were performed [11, 12], there is no consensus on the most sensitive imaging method for detecting hepatic and peritoneal metastases of gastric cancer now. Theoretically pre-operative staging of gastric cancer should mainly focus on assessing distant metastases but not local staging or lymph node status, since if one patient has distant metastases, an exploratory laparotomy always can be avoided . The objective of this systematic review is to provide a comprehensive and up-to-date overview of sensitivity and specificity of imaging [ultrasonography(US), Endoscopic ultrasound(EUS), computed tomography (CT), magnetic resonance imaging(MRI), and 18F-fluorodeoxyglucose positron emission tomography(18F-FDG PET)] in detecting hepatic and peritoneal metastases of gastric cancer. 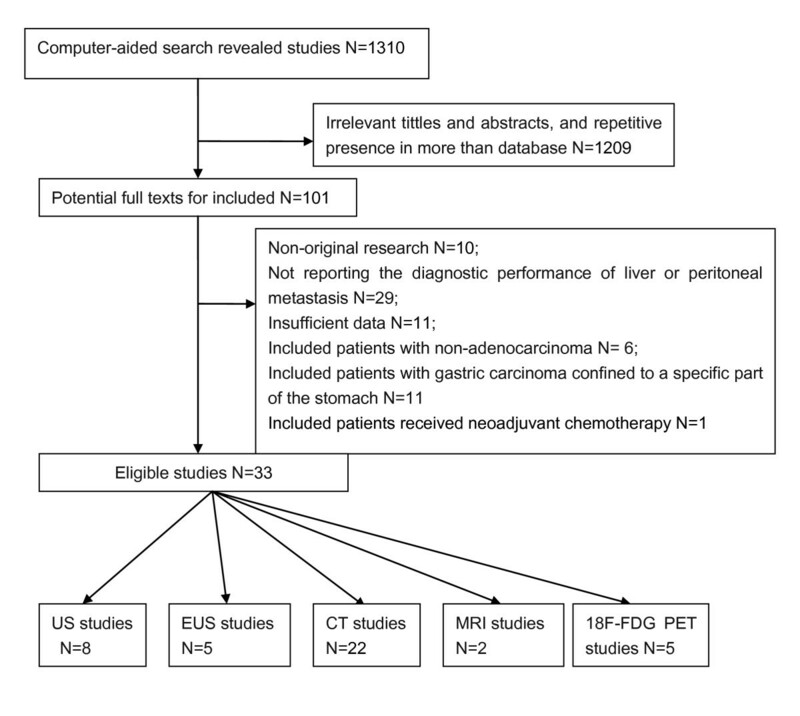 A computer-aided search of the Pubmed/Medline, Embase, The Cochrane Library (issue 1, 2011), and the China Biological Medicine Database (CBM) was conducted to identify relevant publications on the diagnostic performance of imaging (US, EUS, CT, MRI, and 18F-FDG PET) in detecting hepatic and peritoneal metastases of gastric cancer. The upper limit of search date was not limited, and the lower limit was February, 2011. The following search phrases were used: stomach neoplasms, stomach cancer, stomach carcinoma, stomach tumor, gastric cancer, gastric carcinoma, gastric neoplasms, gastric tumor, liver metastasis/metastases, hepatic metastasis/metastases, peritoneal metastasis/metastases, peritoneal seeding, peritoneal involvement, peritoneal carcinomatosis, sensitivity, specificity, accuracy. Both free text and MeSH search for keywords were employed. The language was not limited. To search more potentially relevant trials, reference lists from included studies of electronic searching were screened. Studies assessed the diagnostic value of imaging (US, EUS, CT, MRI, or 18F-FDG PET) in detecting hepatic or peritoneal metastasis of gastric cancer. The standard of reference had to be a surgery or histopathological examination. True-positive, false-positive, true-negative, and false-negative results of imaging methods could be calculated for per-patient. PET had to be performed with intravenous administration of 18F-FDG. Studies included patients with non-adenocarcinoma (eg, lymphoma). Studies only assessed gastric cancer confined to a specific part of the stomach (eg, cardia or gastroesophageal junction), which could not represent overall place where tumour may occur. Vitro studies and studies performed in animals. Studies with a sample size less than 10. Study selection was performed by two authors (Z. Wang and J.Q.Chen) independently according to the inclusion and exclusion criteria. When we found eligible studies with published data more than once, we only included the article with the most patients. Disagreements were resolved by consensus. Two authors (Z. Wang and J.Q.Chen) extracted data using pre-defined tables, which included items as follows: author and publication time, country of source, sample size, interpreters, standard reference, image modality (US, EUS, CT, MRI, or 18F-FDG PET), imaging technique (transducer frequency for US and EUS; use of intravenous contrast, section thickness and gap for CT; use of intravenous contrast, section thickness, gap, field strength and coil type for MRI; time of fasting before scanning, FDG dose, time interval between FDG administration and scanning, attenuation correction, and reconstruction method for 18F-FDG PET) and test result (true positive, false positive, true negative and false negative on per patient basis). Fourteen items of QUADAS were used to assess the methodological quality of eligible studies . Descriptions of each item: Yes (score 2); Unclear (score 1); No (score 0). Total quality score was the summary score of each item. We consider that studies with a total score more than 17 were regarded as high methodological quality, and less than 17 as low methodological quality. 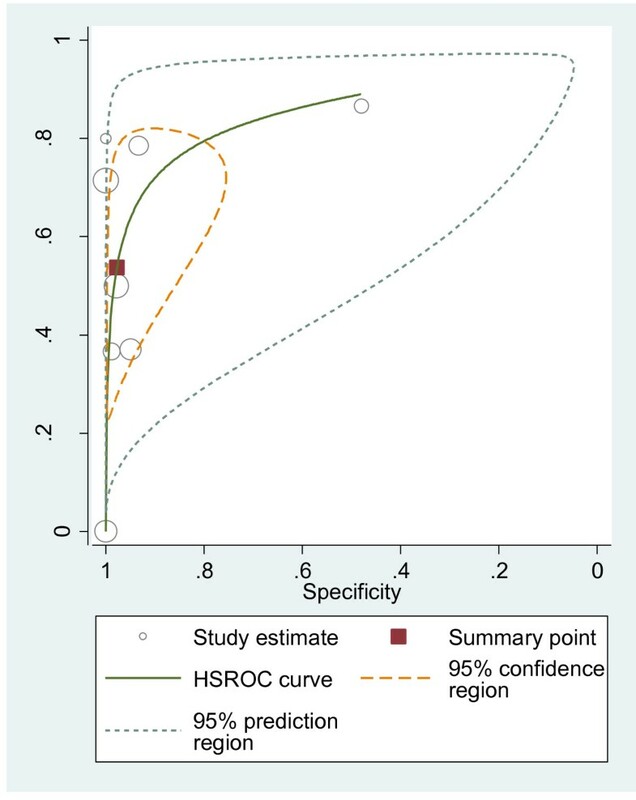 Pooled estimates of sensitivity, specificity and diagnostic odds ratio (DOR) of imaging (with corresponding 95% confidence intervals [CIs]) were analyzed based on the bivariate model . The bivariate model uses a random effect approach for both sensitivity and specificity, which allows for heterogeneity beyond chance as a result of clinical and methodological differences between studies, and the bivariate model is considered as a more valid statistical model for diagnostic meta-analysis [16, 17]. 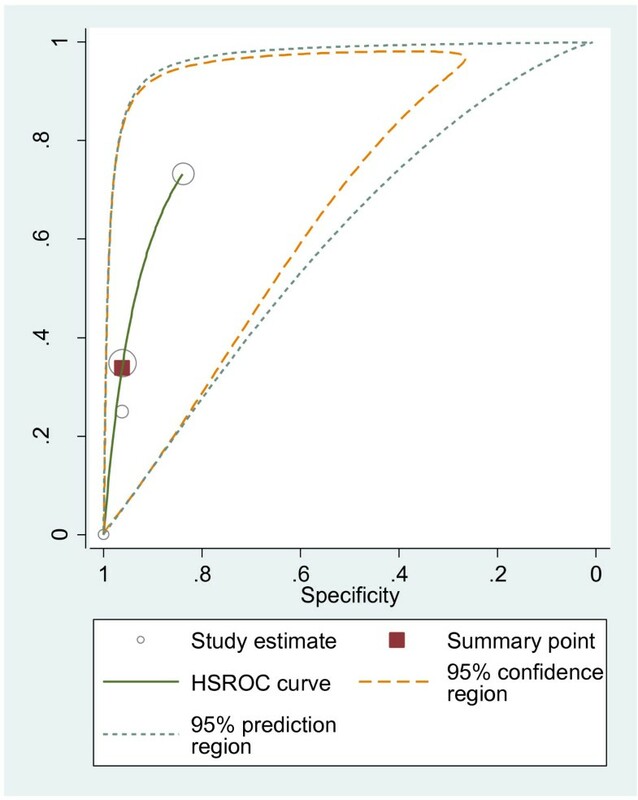 To graphically present the results, we plotted the hierarchical summary receiver operating characteristic (HSROC) curves . As a potential cause of heterogeneity in sensitivity and specificity among the included studies, threshold/cut off effect was tested with the Spearman correlation coefficient between the logit of sensitivity and logit of 1-specificity; heterogeneity induced by factors other than threshold/cut off effect was assessed by using the Cochran Q statistic (χ2 test). Statistical significance of heterogeneity test was assumed when a P value was less than 0.10. As a concern for meta-analysis of diagnostic trials, publication bias was tested using the funnel plot and Deeks test , which was conducted by a regression of diagnostic log odds ratio against 1/sqrt(effective sample size), weighting by effective sample size, with P < 0.10 for the slope coefficient indicating significant asymmetry. Meta-Disc (version 1.4), Stata (version 11.0), especially the midas and metandi commands were used for statistical analysis [19, 20] (Appendix). According to the pre-defined search strategy, total 1310 literatures were revealed: 449 from Pubmed/Medline, 853 from Embase, 0 from the Cochrane Library and 8 from CBM. By screening the tittles and abstracts we found that lots of articles were irrelevant and some were identified in more than one database, thus 101 studies remained for potential inclusion and were obtained in full-text version. After reviewing the full text, 68 studies were excluded. The mainly reasons for excluded studies were as follows: non-original research(eg. review articles), not reporting the diagnostic performance of liver or peritoneal metastasis, insufficient data to construct a 2 × 2 contingency table, inclusion of patients with non-adenocarcinoma, gastric carcinoma confined to a specific part of the stomach or included patients received neoadjuvant chemotherapy. At last 33 studies [21–53] were included (8 US studies, 5 EUS studies, 22 CT studies, 2 MRI studies and 5 18F-FDG PET studies). The process of study selection was listed in Figure 1. QUORUM flow chart for including studies. The 8 US studies were published between 1983 and 2004, and the sample size varied from 21 to 125 (Table 1). The 5 EUS studies were published between 1990 and 2005, and the sample size ranged from 48 to 402 (Table 2). The 22 CT studies were published between 1994 and 2010, and the sample size varied from 36 to 640 (Table 3). The 2 MRI studies were published between 2006 and 2007, and the sample size varied from 25 to 35 (Table 4). The 5 18F-FDG PET studies were published between 1998 and 2006, and the sample size varied from 23 to 124. Among the 5 18F-FDG PET studies, one study  used two kinds of scanners (PT931/04 scanner and SET2400W scanner), and we analyzed the data separatedly according to the kind of scanner (Table 5). The quality of included studies was assessed based on the 14 items of QUADAS (Table 6). The total score varied from 14 to 22 in US studies, 17 to 25 in EUS studies, 14 to 23 in CT studies, 15 to 19 in MRI studies, and 16 to 21 in 18F-FDG PET studies. Table 7 presented the Spearman correlation coefficient for each test. The p value was larger than 0.1 except for EUS in the detection of peritoneal metastasis. Table 8 presented the results of Cochrane-Q test. For EUS in the detection of peritoneal metastasis, Cochrane-Q test failed to be conducted using the metandi command in stata software due to unstability. Except for US and PET in the detection of peritoneal metastasis, the p value of Cochrane-Q test was less than 0.1, which suggested significant heterogeneity between included studies. The results were calculated by using the midas command in stata software. The data were available in 8 US studies [21–27, 29], 2 EUS studies [27, 31], 18 CT studies [21–23, 27, 29, 36, 39, 41, 43–51, 53], 2 MRI studies [37, 38], and 4 18F-FDG PET studies [35, 36, 41, 42]. Meta-analysis was based on the bivariate model in the presence of significant heterogeneity. Pooled sensitivity for US, CT and 18F-FDG PET in detecting liver metastasis were 0.54 (95% CI: 0.34-0.73), 0.74 (95% CI: 0.59-0.85) and 0.70 (95% CI: 0.36-0.90) respectively (Table 9). 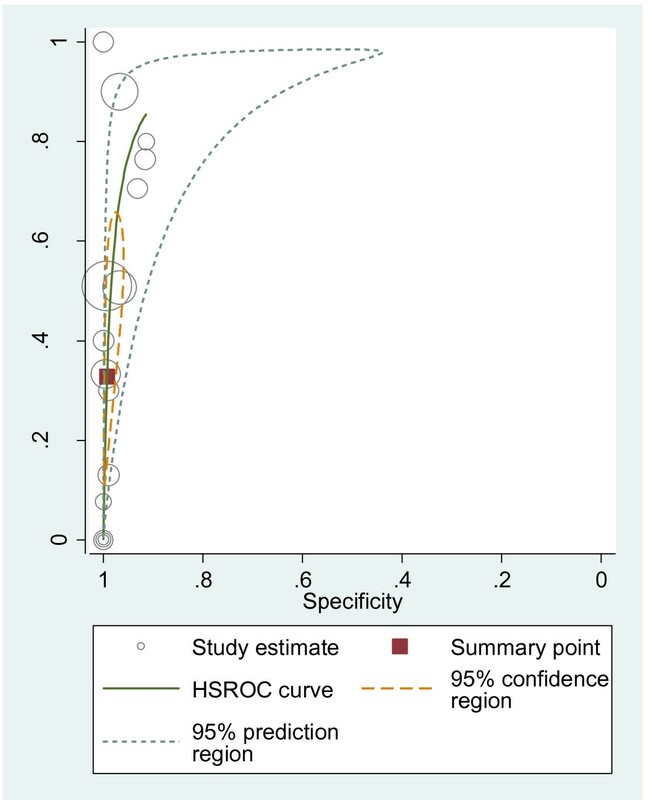 Sen: sensitivity; Spe: Specificity; DOR: diagnostic odds ratio; CI: confidence interval. The results were combined using the metandi command (based on bivariate model) in stata software. Pooled DOR for US, CT and 18F-FDG PET in detecting liver metastasis were 50.25 (95% CI: 13.48-187.32), 251.14 (95% CI: 83.53-755.07) and 56.46 (95% CI: 8.47-376.23) respectively (Table 9). Only two studies' data were sufficient for EUS and MRI, and we did not conduct pooled analysis, but presented the result of each study in Table 10. The data were available in 5 US studies [21–23, 25, 29], 4 EUS studies [30–33], 15 CT studies [21, 22, 29, 34, 36, 39, 40, 43–48, 52, 53] and 4 18F-FDG PET studies [34–36, 42]. Meta-analysis was based on the bivariate model in the presence of significant heterogeneity. Pooled sensitivity for US, EUS, CT and 18F-FDG PET in detecting peritoneal metastasis were 0.09 (95% CI: 0.03-0.21), 0.34 (95% CI: 0.10-0.69), 0.33 (95% CI: 0.16-0.56) and 0.28 (95% CI: 0.17-0.44) respectively (Table 9). Pooled specificity for US, EUS, CT and 18F-FDG PET in detecting peritoneal metastasis were 0.99 (95% CI: 0.96-1.00), 0.96 (95% CI: 0.87-0.99), 0.99 (95% CI: 0.98-1.00) and 0.97 (95% CI: 0.83-1.00), respectively (Table 9). Pooled DOR for US, EUS, CT and 18F-FDG PET in detecting peritoneal metastasis were 10.63 (95% CI: 1.54-73.36), 13.07 (95% CI: 6.42-26.62), 66.18 (95% CI: 27.28-160.53) and 12.49 (95% CI: 2.22-70.10), respectively (Table 9). We plotted HSROC curves to graphically present the results (Figure 2, 3, 4, 5, 6, 7, 8). In HSROC curves, the index test's sensitivity (true positive rate) was plotted on the y axis against 1-specificity (false negative rate) on the x axis. In addition, the 95% confidence region and a 95% prediction region around the pooled estimates were plotted to illustrate the precision with which the pooled values were estimated (confidence ellipse of a mean) and to show the amount of between study variation (prediction ellipse; the likely range of values for a new study) . 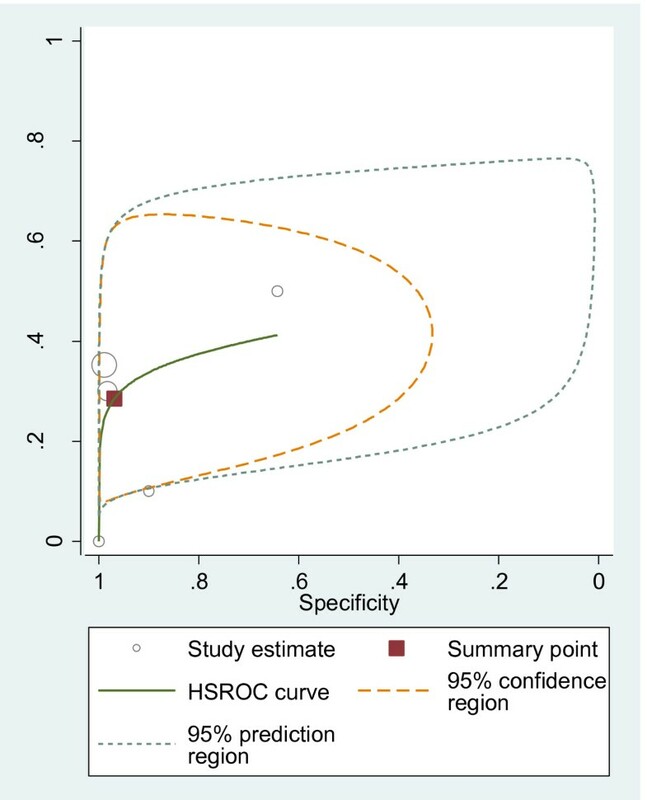 HSROC curve of US for the detection of liver metastases. HSROC curve of US for the detection of peritoneal metastases. HSROC curve of EUS for the detection of peritoneal metastases. 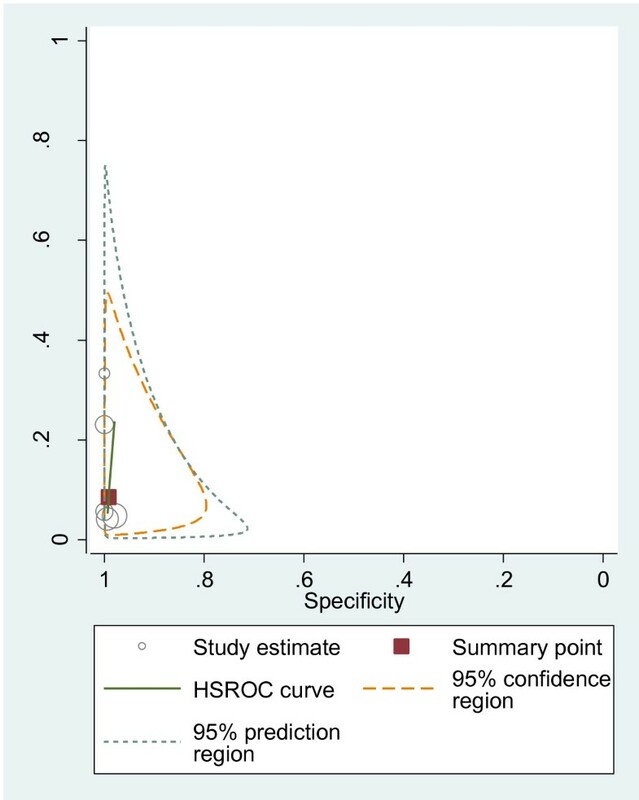 HSROC curve of CT for the detection of liver metastases. HSROC curve of CT for the detection of peritoneal metastases. HSROC curve of 18F-FDG PET for the detection of liver metastases. HSROC curve of 18F-FDG PET for the detection of peritoneal metastases. Because the number of included studies was few, we only explored publication bias using the data of CT in detecting liver metastasis, which included 18 studies. As a result, the funnel plot seemed symmetrical with a P value of 0.66, and this suggested a low risk of publication bias (Figure 9). 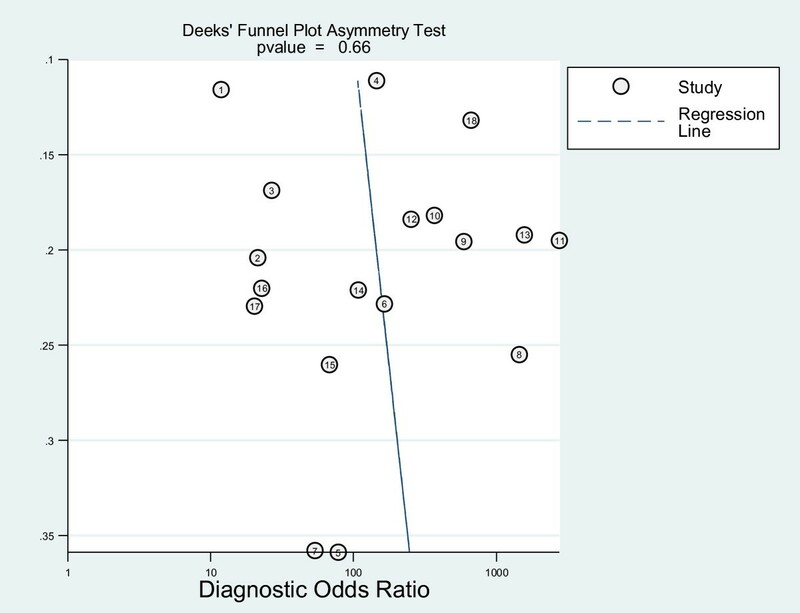 Funnel plot based on the data of CT for the detection of liver metastases. As far as we know, this systematic review is the first study that evaluates the summary estimates of sensitivity and specificity of five imaging modalities which are currently used for the detection of hepatic and peritoneal metastases. The pooled result basing on the bivariate model showed that CT is the most sensitive imaging method [0.74 (95% CI: 0.59-0.85)] with a high rate of specificity [0.99 (95% CI: 0.97-1.00)] in detecting hepatic metastasis, and EUS is the most sensitive imaging modality [0.34 (95% CI: 0.10-0.69)] with a specificity of 0.96 (95% CI: 0.87-0.99) in detecting peritoneal metastasis. 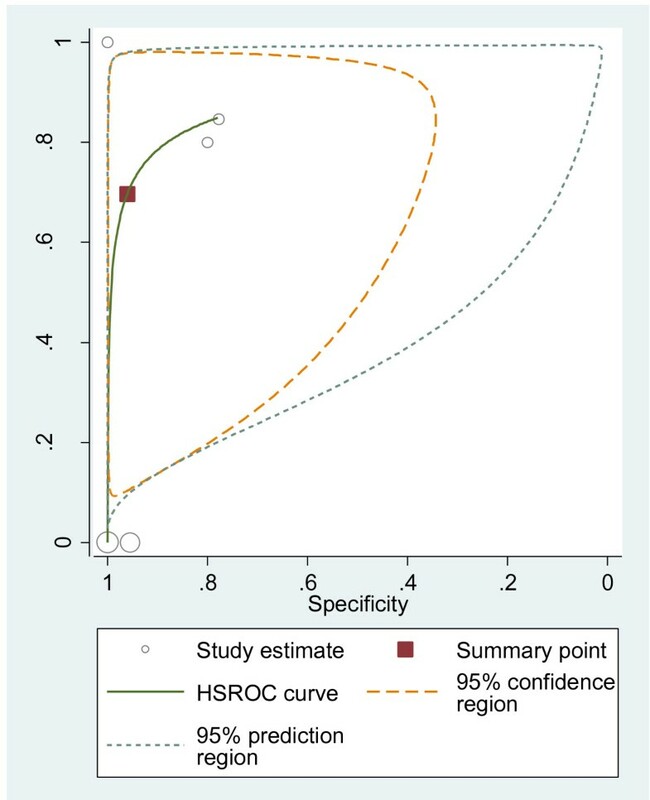 The strengths of this systematic review were its well-defined search strategy, selection of study according to the strict inclusion criteria, independent methodological quality assessment by two reviewers and more valid statistical model for diagnostic meta-analysis in the presence of heterogeneity. Of course, our study was not faultless. Firstly, some included studies had a low methodological quality. For instance, the two eligible MRI studies only included patients with advanced gastric cancer, this might lead to bias by non-representative patient spectrum. Additionally, the great mass of included studies had a potential bias of partial verification, which was interpreted as not all of the study group receive confirmation of the diagnosis by the reference standard. It was especially noted that all included studies did not report the uninterpretable/intermediate test results, which might lead to the biased assessment of the test characteristics. Secondly, except for CT studies, the number of eligible studies is less. Besides many clinical characteristics of patients (such as Lauren classification) and technology parameters of imaging (such as slice Thickness and interslice gap of CT) were mixed or missing in included studies, so we failed to perform subgroup analysis or meta-regression, which might find out other possible causes of heterogeneity. Thirdly, due to few eligible studies, we only used the data of CT in detecting liver metastasis to test publication bias, therefore potential bias might occur. Fourthly, heterogeneity caused by threshold/cut off effect was present for EUS in detecting peritoneal metastasis, thus we should interpreted the pooled results prudently. DOR, which means the ratio of the odds of positive test results in diseased group relative to the odds of positive test results in non-diseased group, is considered as another important indicator of test accuracy that combines the data from sensitivity and specificity into a new index . The value of a DOR ranges from zero to infinity, with higher value indicating higher accuracy. A DOR of 1.0 shows that a test can not distinguish between patients with the disease and those without it. We found that CT seemed to be more helpful in the detection of liver and peritoneal metastases with a pooled DOR 251.14 (95% CI: 83.53-755.07) and 66.18 (95% CI: 27.28-160.53) respectively. 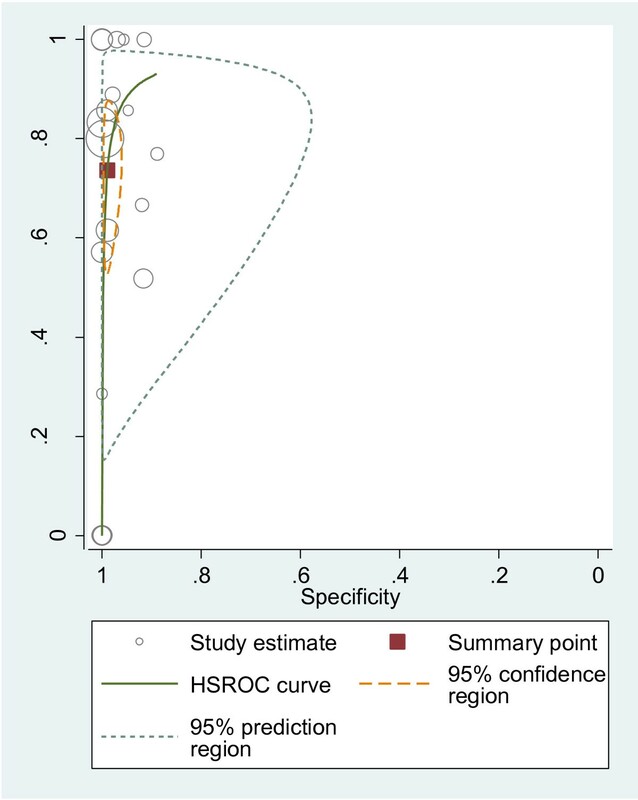 Unlike traditional SROC plots, HSROC curves was plotted based on hierarchical models in our meta-analysis, which clearly presented the result of a global summary of test performance, the 95% confidence ellipse around the mean values of sensitivity and specificity of radiographer reporting, as well as a 95% prediction ellipse for individual value of sensitivity and specificity. Previous studies reported that sensitivity of US ranged from 0.36-0.87 in detecting liver metastasis [22, 25, 27] and 0.05-0.33 in detecting peritoneal metastasis [25, 29]. Then most of these studies excluded patients with obvious distant metastases, which might be the reason of low sensitivity of US in detecting liver and peritoneal metastases. We found that the pooled sensitivity of US in assessing hepatic metastasis was as low as 0.54 (95% CI: 0.34-0.73) with an acceptable specificity of 0.98 (95% CI: 0.90-0.99), and the pooled sensitivity in detecting peritoneal metastasis was 0.09 (95% CI: 0.03-0.21) with a relatively high specificity of 0.99 (95% CI: 0.96-1.00). This showed that US was more helpful in patients suspected of liver or peritoneal metastases. EUS was initially developed primarily to overcome the limitations of abdominal ultrasonography in pancreas and a number of studies provided evidences on the high diagnostic accuracy and important role of EUS in staging of gastric cancer . Compared with abdominal US, EUS has the advantage of placing the transducer close to the lesion without interference of bowel gas, bone or fat. However, EUS has an inherent disadvantage of operator dependency, which was the same as abdominal US. Although it is well suitable for the assessment of T staging, EUS has a limited effect in the overall assessment of more distant spread. Additionally, EUS is an invasive technique requiring sedation which will cause possible sedation-related complications . Previous studies mainly focused on the usefulness of EUS in the evaluation of local invasion and LN staging [11, 12]; but studies aiming at assessing the liver and peritoneal metastases were few [30–33]. We did not perform combined analysis using the data of EUS in the evaluation of liver metastases in the case of only two eligible studies. Although the result of our meta-analysis indicated that EUS was the most sensitive imaging modality in detecting peritoneal metastasis, the combined sensitivity was as low as 0.34 (95% CI: 0.10-0.69). This was similar with another systematic review, which concluded that EUS is not designed to look at distant metastasis . It was reported that laparoscopy facilitated detection of EUS or CT-occult micrometastases on the peritoneal surface or in the liver , and identified EUS or CT-occult metastatic disease in 23% to 37% of patients [24, 58]. The result suggested that laparoscopy should be integrated as part of the recommended staging algorithm in the detection of liver and peritoneal metastases in aftertime. Abdominal CT can demonstrate not only the stomach wall and the adjacent tissue, but also the presence of distant metastases by providing rapid and high spatial resolution imaging [21, 59]. The sensitivity of CT in the detection of liver metastasis ranged from 0.29-1.00 in included studies [21–24, 27–29, 44–51, 53], the cause of so wide an interval possibly was the use of different tomography techniques in included studies, for example some researchers used single-detector row CT but others used multi-detector CT (MDCT), which can overcome the low scanning speed of single-detector row CT by its ability to make thinner sections in a shorter time. In our study we found that the diagnostic accuracy of CT was moderate with a pooled sensitivity of 0.74 (95% CI: 0.59-0.85) in the detection of liver metastasis. Additionally, the result of meta-analysis indicated that the sensitivity of CT in detecting peritoneal metastasis was very low [0.33 (95% CI: 0.16-0.56)], which supported the viewpoint that peritoneal metastasis was one of the limitations of CT in predicting the stage of gastric cancer preoperatively . Newer MDCT technology (such as the application of 128- to 256-section MDCT scanners or dual-source technology) was reckoned to improve diagnostic performance with a spatial resolution of 5 mm or less in diameter . Compared with CT, PET has an advantage of providing functional information. Currently PET is not only being evaluated as a staging tool for gastric cancer, but also useful for monitoring tumor recurrence and response to neoadjuvant therapy [59, 60]. Although some researchers reported that PET had utilities in detecting liver and peritoneal metastases (the sensitivity could achieve 100% and 57% respectively) [42, 61], we did not found that 18F-FDG PET had advantages over CT in the assessment of liver and peritoneal metastases in our meta-analysis. Possible reasons for the reported low to moderate sensitivity of FDG-PET is lack of detailed anatomic information in the area of significant tracer uptake and its limited resolution. It was reported that combining both PET and CT (PET/CT) has demonstrated further improvements in diagnostic accuracy recently . The method unites the high anatomic spatial information from CT with the functional information offered by PET, and has a benefit of the rapid CT based attenuation correction of PET. This can decrease scanning time and increase the degree of comfort. Pyrimidine analog 3-deoxy-3-18F-fluorothymidine (18F-FLT), a new stable PET tracer was used for improving the diagnostic accuracy lately. It was reported that 18F-FLT had a higher sensitivity than 18F-FDG PET in the detection of locally advanced gastric cancer . However, whether this imaging modality will improve the diagnostic accuracy of liver and peritoneal metastases needs further investigation. MRI has evolved to be an important imaging method for detection and characterization of most of common diseases of the abdomen including gastric cancer [63, 64]. Advantages of MRI over CT include the ability of generating significantly greater soft tissue contrast resolution, and the ability of removing the risk of iodinated contrast-induced nephropathy or ionizing radiation . However only two eligible MRI studies [37, 38] were identified in our review, and all from China, therefore the data were not combined. The two studies found that MRI had both high sensitivity and specificity in detecting liver metastasis. Some researchers reported that diffusion-weighted (DW) MRI was more sensitive than CT in detecting liver and peritoneal metastases, and functional parameters such as apparent diffusion coefficient (ADC) could monitor the response to neoadjuvant chemotherapy . These results seemed inspiring, whereas the sample size was small and methodological quality was moderate. Therefore more MRI (especially DW-MRI) studies focusing on evaluating the liver and peritoneal metastases are urgently needed in future. Although the result of our meta-analysis showed that CT was the most sensitive imaging method with a high rate of specificity in detecting hepatic metastasis, and EUS was the most sensitive imaging modality with a relatively low rate of specificity (compared with the three other imaging methods) in detecting peritoneal metastasis, we concluded that US, EUS, CT and 18F-FDG PET did not obtain consistently high sensitivity and specificity in detecting liver and peritoneal metastases in patients with gastric cancer. More attention should be paid to laparoscopy, PET/CT, DW-MRI, as well as new PET tracers such as 18F-FLT in the detection of liver and peritoneal metastases of gastric cancer in future. Midas: is a comprehensive program of statistical and graphical routines for undertaking meta-analysis of diagnostic test performance in Stata. It facilitates exploratory analysis of heterogeneity, publication and other precision-related biases. Metandi: The metandi command display the results in two alternative parameterizations and produce a customizable plot. It also displays some familiar summary measures (such as sensitivity and specificity). The command requires either Stata 10 or above (which has the new command xtmelogit), or Stata 8.2 or above with gllamm installed. We thank Mao Zhifeng (Neurology Department, The First Affiliated Hospital of Guangxi Medical University) for their guidance in statistical analysis. We also thank colleagues from The First Affiliated Hospital of Guangxi Medical University for their warmhearted assistance in developing this manuscript. Supported by The National Natural Science Foundation of China, Grant No. 30560151. ZW and JQC contributed equally to this article. ZW and JQC designed this study; ZW and Chen JQ performed this research; ZW and JQC analyzed the data; JQC interpreted the results; ZW drafted the manuscript; JQC revised the paper. The two authors both approved the final manuscript.